This time being the rare occasion that Hanukkah occurs during Thanksgiving, many Jewish families will be having huge celebrations over the next few days. That's quite a bit of activity going on, making if a little hard to keep up with what your pet is doing during this time. We want all holiday to be fun, but we want safe celebrations too. I found this article by Dr. Patrick Mahaney (some of you know Dr. Pat from BlogPaws and his many appearances on TV Pet shows). He gives this advice on petMD.com. 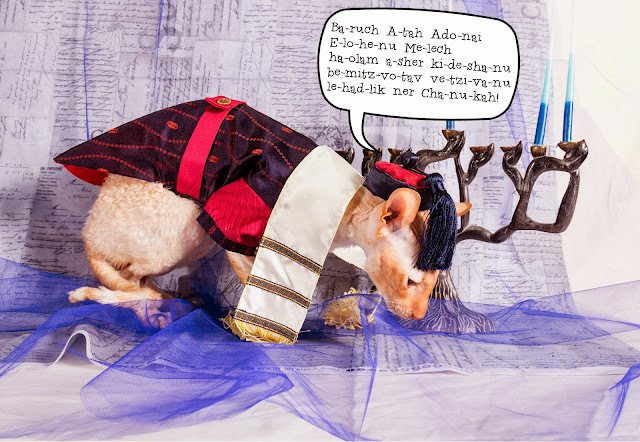 Hanukkah brings so much excitement with rich (delicious) food, toys, gifts, and the beautiful Menorah; it can be easy to forget that these traditions aren't good for our pets. Plan ahead and use common sense to keep Fido and Fluffy safe over Hanukkah and other holiday festivities. Doughnuts, also known as sufganiyot, are made of a fried dough filled with artificially colored red custard or jelly, and then sprinkled with powdered sugar. This celebratory pastry sounds tasty, yet is heavy on calories, fat, and sugar. A pet’s ingestion of Hanukkah doughnuts could lead to gastrointestinal signs, including vomiting, diarrhea, and decreased appetite. Severe endocrine conditions, such as pancreatitis, can also ensue from your pet’s inappropriate sufganiyah consumption. Latkes are a good Hanukkah treat harboring considerable toxic potential for pets. Latkes are potatoes, eggs and sometimes Matzah with onion, fried in oil, and slathered with sour cream and applesauce. Freshly grated onion, one of the Latke’s three main ingredients, causes Heinz body anemia in both dogs and cats. Besides onion’s toxicity, Latkes are high in fat and carbohydrates, which are likely to upset your pet’s digestive tract. Each Hanukkah, children, eagerly wait to receive coin-shaped chocolates wrapped in gold or silver colored foil. Careless placement of these tasty treats could permit a curious pet to taste the precious bounty. As chocolate contains theobromine and caffeine (both methylxanthine stimulants), a dog’s consumption of the faux denomination can cause severe toxicity. Also, the metallic foil wrapper, sugar, and fat all can cause gastrointestinal problems, including vomiting, diarrhea, and pancreatitis. The whirling excitement of this four-sided top may attract the interest of curious pets. Avoid severe gastrointestinal foreign body obstructions by preventing your pet from participating in the festivities. Additionally, keep the dreidel and other holiday game pieces out of your pet’s reach when not in use. The Menorah is a quintessential Hanukkah symbol. Over eight successive days, the candles burn every day until the Menorah is fully ablaze. That can pose potential life threatening danger for both pets and humans since tradition dictates the candles burn themselves out, creating a fire hazard for the entire household. Confine your pet away from the room containing a lit Menorah, or update your Hanukkah observance by creating a pet-safe glow using battery operated candles. With safety and fun in mind, everyone has a joyous and happy Hanukkah, Chag Sameach! Pets and dreidel interruptions. Watch out! Fabulous list. I didn't know Dr. Patrick had written that! We've talked about latkes & hannukiahs before, and the dreidel swallowing makes sense, but the whole association between sufganiyot and pancreatitis was new to us!